In a letter to the Daily Telegraph they called for RE to be included in the new English Baccalaureate. The Department for Education (DfE) said the English Baccalaureate "does not stop any school offering RE GCSEs". In the letter published in the Telegraph, faith leaders warned that a failure to act would be a "serious flaw" in David Cameron's Big Society project. The signatories included the Rev Michael Heaney, president of Churches Together in England, and Farooq Murad, secretary-general of the Muslim Council of Britain. They write: "Changes to the role and capacity of local authorities, coupled with the extension of the academies programme, are in danger of undermining the nature and quality of RE." "Also, recent policy initiatives in relation to GCSE examinations are already leading to a deterioration in the provision for RE in many secondary schools." 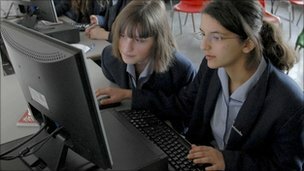 RE teachers recently warned that religious education could disappear from many secondary schools because of the new English Baccalaureate. A DfE spokesman said it is compulsory for every student to study RE up to 16, adding that success in RE GCSE "continues to be recognised in the annual GCSE tables, as well as being a valuable qualification in its own right". He said: "The English Baccalaureate does not stop any school offering RE GCSEs and we have been clear that pupils should take the GCSEs that are right for them. "It is for teachers and parents to help pupils make the right choice. All academies and free schools must offer a broad and balanced curriculum." The "Bacc", which was introduced last December, is a new league table measure which ranks schools according to how many pupils gain grades A*-C in GCSEs in five subject areas: English, maths, a language, science and either geography or history. A recent survey by the National Association of Teachers of Religious Education (NATRE) found that a quarter of the state-funded schools featured in its research were not teaching RE to pupils aged from 14 to 16. The faith leaders called on the prime minister to do more to develop "a clear strategy" for the subject. "Failure to work with faith communities, along with their partner academic and professional associations, would represent a serious flaw in the Big Society project," they write. Religion and sport: Do prayers help players?